The rally in bonds gained momentum as traders turned their focus to a worrying global economic outlook. Stocks fell and the dollar rose. Treasury 10-year yields dropped to the lowest since December 2017, and rates on benchmark German bunds sank further below zero after European Central Bank President Mario Draghi said an accommodative stance is still needed. Energy companies in the S&P 500 Index joined a slide in oil, while industrial shares gained. The pound fluctuated as U.K. Prime Minister Theresa May promised to resign if Conservative Party colleagues drop their opposition to her Brexit strategy and vote to ratify a deal. Traders piled into bonds amid concern about a slowdown in global growth. Recent data showed weakness from U.S. housing to retail sales and consumer sentiment, prompting a more dovish tone from the central bank. 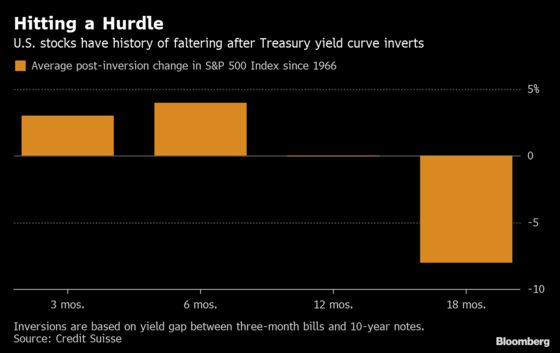 A closely watched segment of the yield curve inverted last week -- a gauge that’s served as a recession warning. Fed funds futures are now pricing in more than 30 basis points of easing by the end of 2019. Speculation that the Federal Reserve will consider lowering rates is spreading, with Legg Mason Inc. unit Brandywine Global Investment Management forecasting a cut this year. Stephen Moore, President Donald Trump’s pick for an open Fed board seat, said in a New York Times interview that the central bank should immediately cut rates by half a percentage point. Elsewhere, the Brazilian real led losses among major peers as investors see a bumpier road for a key pension overhaul. New Zealand’s dollar tumbled as policy makers joined the shift away from tighter policy. The cost of borrowing liras overnight on the offshore swap market touched 1,000 percent after Turkey orchestrated a currency crunch before an election that will test support for President Recep Tayyip Erdogan’s rule. U.K. Parliament set to stage several key votes on Brexit on Wednesday. The S&P 500 Index fell 0.5 percent to 2,805.37 at 4 p.m. in New York. The MSCI Asia Pacific Index declined 0.2 percent. The MSCI Emerging Market Index decreased 0.6 percent. The euro decreased 0.2 percent to $1.1244. The Japanese yen increased 0.1 percent to 110.51 per dollar. The British pound declined 0.1 percent to $1.3196. The yield on 10-year Treasuries fell five basis points to 2.37 percent. Germany’s 10-year yield declined seven basis points to -0.08 percent. Britain’s 10-year yield increased one basis point to 1.013 percent. West Texas Intermediate crude fell 0.9 percent to $59.41 a barrel. Gold dipped 0.3 percent to $1,316.90 an ounce.